The good old board fence is still by far my personal favorite. I love design, elegance, and simplicity and the board fence has all the above. It is a piece of art that can’t be reduced to a science. Posts are spaced every eight feet and typically three or four boards run horizontally. 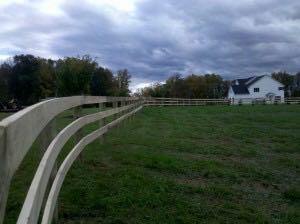 Under the seasoned and artistic eye of our ProFence team, it flows smoothly over hills and gently curves around property lines and is possibly the most profound way to showcase your estate. It draws your guests into your home with a country welcome. 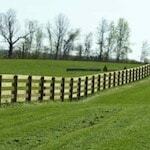 You may decide to leave your board fence a natural wood color or paint it a bright and distinguishing white. Or my personal favorite: soak the wood board fence in a waste oil or other natural oils to bring out a deep warm color; almost black. This looks best when your property has a rustic country style. Whichever you choose, the board fence is one of the greatest assets you can use to enhance your property’s value appearance, general feel, and style. Though the board fence requires more maintenance than a wire fence, I believe if you take pride in your property, you will find the extra effort well spent. 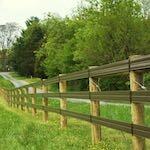 Universally, wood board fencing requires a post spacing of eight feet. The wood boards that are used are 16-feet long and need to span two openings (or stretch across three posts). 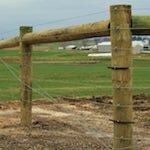 Although board fence posts can be either round or square, ProFence only uses round posts because they last longer. When a board is nailed to a square post there is more surface for the board to contact, creating a moisture trap between the two pieces of wood. That in turn can lead to wood rot, decreasing the longevity of your fence. Here our team of wood fence installation experts install round wood posts which will eventually become an aesthetically pleasing and long lasting wood board fence. 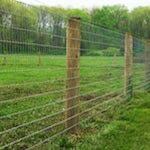 Almost all board fences will have either three or four boards that run horizontally along the posts. 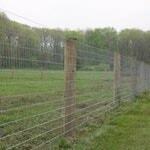 The four-board fence will be stronger and will cost more per lineal foot then the three-board fence. At ProFence we only use three kinds of boards—oak, treated southern yellow pine, and hemlock—all of which have about a 15-year maintenance-free life expectancy. Oak boards fall into the hardwood tree family. Horses do not eat oak as easily as pine and hemlock, and it holds up better under abuse, and has tremendous durability. The downside is that as it dries out it tends to warp a bit. Hemlock boards weather so well that they do not need any chemical treatment to preserve them. This natural ability to withstand the elements without rotting and decaying also helps protect our planet by eliminating the need for harsh chemical preservatives. These boards also do not warp and will look great for a long time. The downside is if your horse is a cribber you will need to put a hot wire on the fence to keep your horse from eating the boards. Southern yellow pine boards are a very popular board because it is one of the stronger boards in the pine family. And when treated with the chemical wood preservative chromated copper arsenate, it will last a long time and not warp. It will also be the most resistant to high acid content areas such as your barn or any other area with lots of manure. Board fence is by far most popular for horses but is also used for cattle. 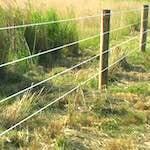 To really make the fence useful and keep wear to a minimum, it is important to install a hot wire to keep cattle from pushing against it and to keep horses from eating it.